Spotify released their music streaming service app for the iPhone a while ago, and I thought it was about time I tested it out to see exactly what it offers. 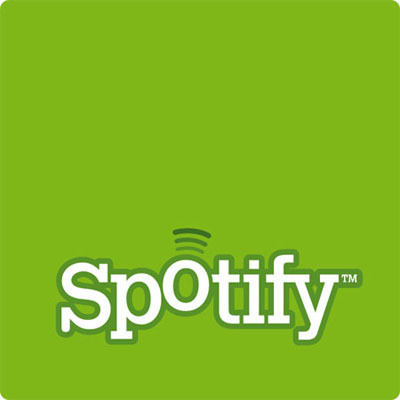 Whilst the app itself is available free from the iTunes store, to actually use it you need to sign up for Spotify‘s premium service at £9.99 a month, which prompted a lot of negative user reviews in the iTunes store. So, is it worth it? The answer to that question is not a simple one, as many factors have to be considered, and will likely boil down to what each individual user is looking for. I’ll presume that most of you know broadly what Spotify is, as it seems to have become one of 2009’s buzzwords, but it’s basic function is that of a music streaming service. This comes in two forms, a free ad-based model, or the previously mentioned premium service at £9.99, both of which give you access to millions of songs to listen to, or if you wish in most cases, buy. 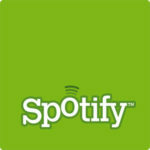 In the premium service, music is streamed in high quality at 320 kbps usually, and users can create multiple playlists to listen to, or share with friends. You can also save these playlists so that you can listen to them when you’re offline and unable to connect to the internet. And it’s that feature that Spotify have pushed as a major feature of the iPhone app, allowing you to use it when you can’t get a mobile phone signal, perhaps on the London Underground or in Airplane mode, for example? It is a great feature, but it should be noted that to do that, it has to store the songs somewhere, using up memory on the iPhone itself. And as it boasts to storing up to 3,333 tracks offline, used fully it will eat in to the memory quite heavily. When I first started testing it with numerous playlists, I quickly found I’d used more than 1GB up and my memory was full, causing the device to stop syncing the photos I had stored. Deleting the playlists made no difference to this, and I had to uninstall the app and then reinstall to get the memory cleared. So as long as you keep one eye on how much memory you have available to you, this should be a very valuable feature. The syncing of playlists is done via Wi-Fi, and is done by selection, so you don’t have to have all your playlists synced at the same time. You can just sync select ones before you go out somewhere, to give yourself something different to listen to each time. This could also be useful if you’re on a restricted mobile data usage plan, so you can avoid costly streaming over 3G. As you’d expect, you have full flexibility over the playlists. You can rearrange the order of individual tracks, shuflle them, add to or delete, or change the order of the playlists themselves. Playlists are available on the device for 30 days, before going online to confirm you are still subscribed to the service. 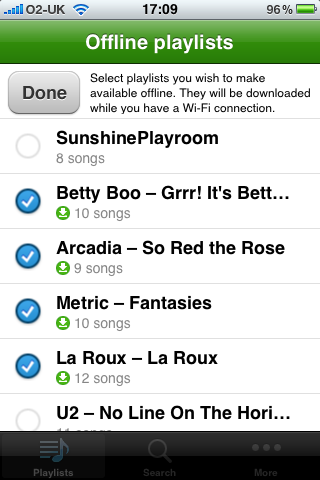 If you simply want to listen to streaming music without making playlists, it couldn’t be easier. Just use the search function (by Album, Artist or Track), find what you’re looking for and hit play. It streams very well over 3G or Wi-Fi, and the quality does sound very good to my ears, although rather strangely, the app doesn’t appear to have an actual volume control that I could find. If you do need to adjust the volume, you can use the buttons on the side of the iPhone itself. There are a few drawbacks with the app though, that may put quite a few people off. Firstly, it can’t run in the background, so you can’t listen to it whilst using any other of the iPhone’s apps. This isn’t Spotify‘s fault, and is down to Apple themselves. It does however remember where you are in a track, so if you’re interupted by a call or text, it’ll resume in the correct place. The other feature that many people would like to see from it is scrobbling, something that anyone who uses Last.fm will sorely miss. Scrobbling is a form of data collection that keeps a record of what music you’ve been playing, and allows user to build up detailed data about their music listening habits. Hopefully Spotify will be able to rectify this in a future update to the app. For now though, it’ll be a very useful app for many people, allowing the user to listen to an almost endless amount of new or old music for £9.99 a month, limited only by the library Spotify offers. There are still many gaps in this, most notably The Beatles, but this is also true of it’s many competitors such as we7 or Sky Songs. Below are some useful links, and a short demo video of the app courtesy of You Tube. This entry was posted on Friday, January 1st, 2010 at 6:13 pm	and is filed under Music, Reviews, Technology. You can follow any responses to this entry through the RSS 2.0 feed. You can leave a response, or trackback from your own site.